Thank you. These comments are solely my own. It was in this county courthouse in Virginia that, in 1762, American Patriot Patrick Henry argued the case for the colony's Two Penny Act. His argument helped to stoke colonial resistance to British taxation. When in 1978 a judge sought to close proceedings in this historic courtroom, Richmond Newspapers challenged the State of Virginia, arguing that public access to the courts was a fundamental tenet of democracy, guaranteed by the First Amendment. The Supreme Court agreed. 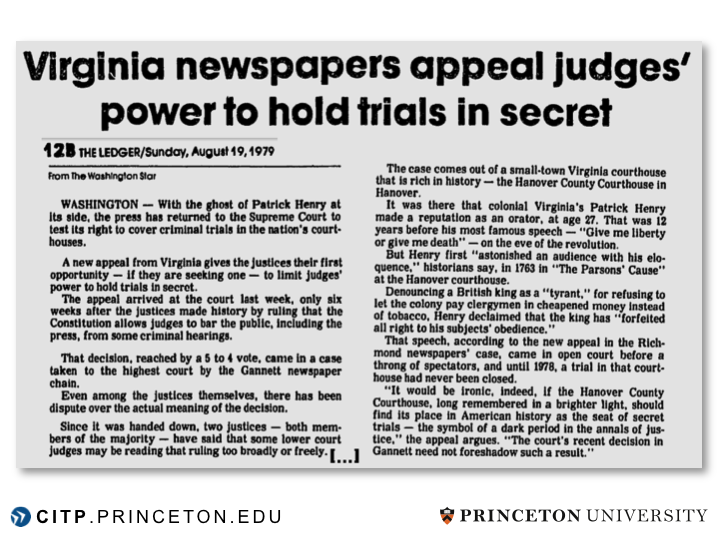 Richmond Newspapers v. Virginia has served as a touchstone for subsequent cases guaranteeing access to court records as well. 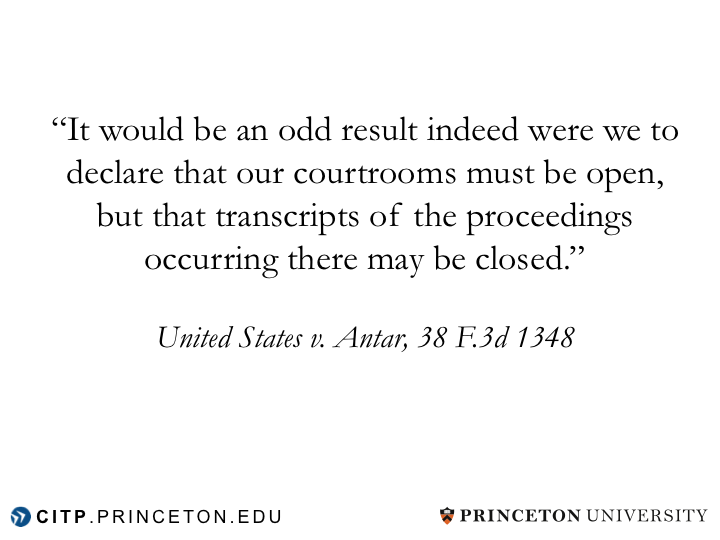 If transcripts must be open, we should not impose a prohibitive tax on access to them. 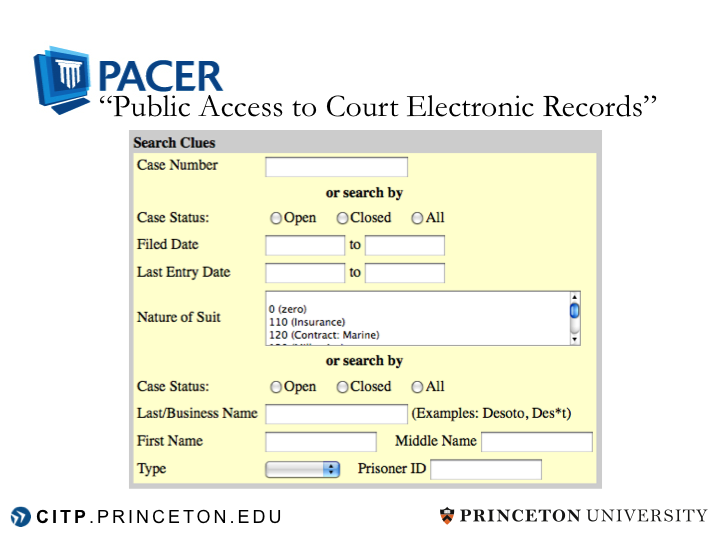 Today, the courts offer electronic records through the PACER web site, which charges for search results, docket lists, and documents. While ten pennies per page might not sound like much, it's easy to rack up a huge bill. Plus, how much would you use Google if you had to submit your credit card and pay per search? PACER is making a killing, with $120 million dollars in revenue for 2012. Even with a highly inefficient system architecture, they only manage to spend about $20 million dollars on PACER expenses per year. Where does the rest of the money go? They spend it on other stuff. This is illegal. In 1992, Congress passed a law saying that the courts could charge only to recoup costs. 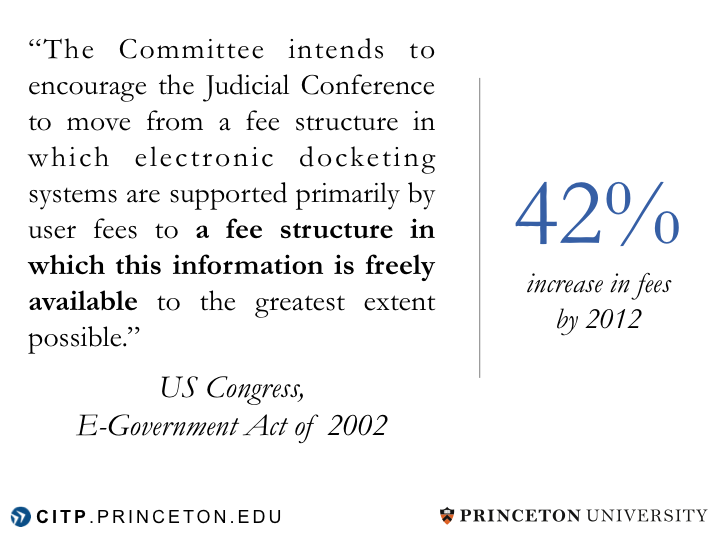 Ten years later, Congress strengthened that law and said that it expected the courts to move to a free system. 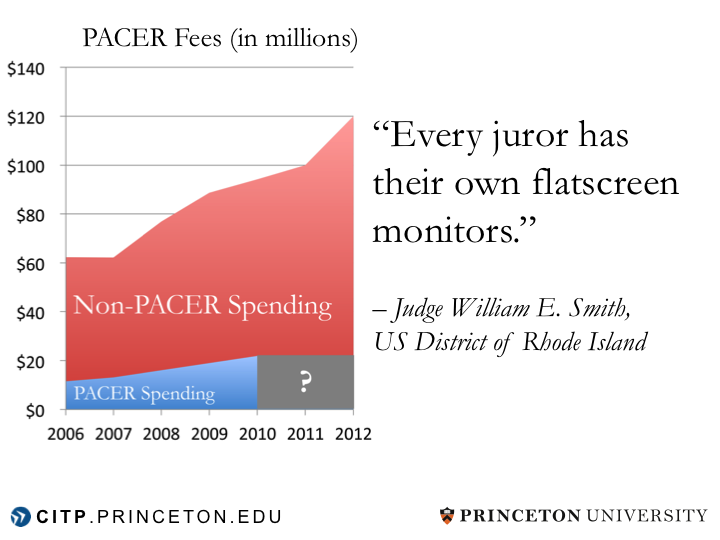 PACER fees have increased 42% since then. This makes some important democratic activities impossible. 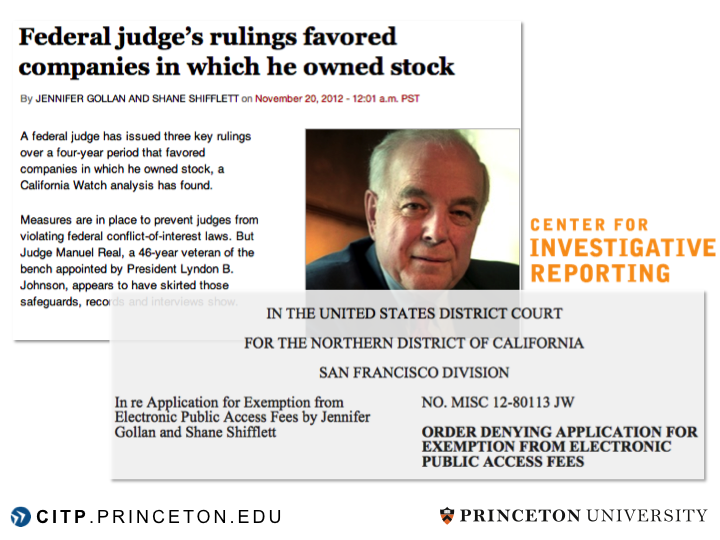 For example, the Center for Investigative Reporting would like to research judicial misconduct using "big data" style analytics on court records. They were denied a PACER fee waiver and appealed to the 9th Circuit. The case is ongoing. 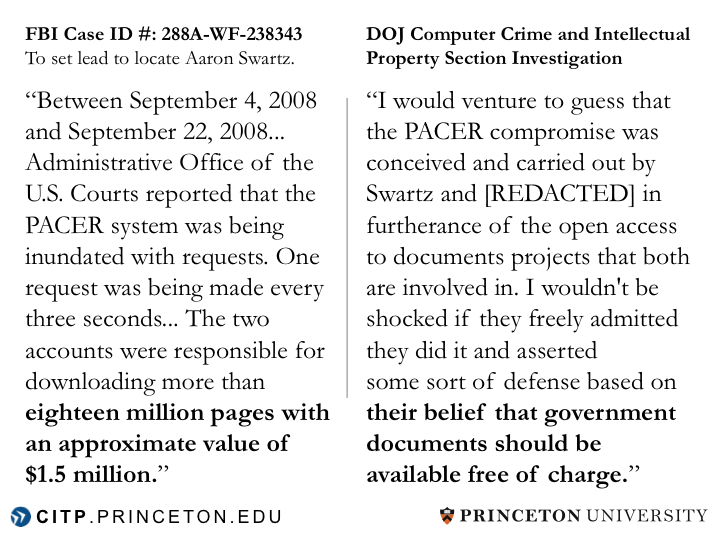 In 2008, my friend Aaron Swartz helped to legally liberate millions of PACER records. The FBI investigated him. The Department of Justice investigated him - and apparently they investigated me too. If they had asked, I would have freely admitted my involvement, and told them that government documents should be available free of charge. 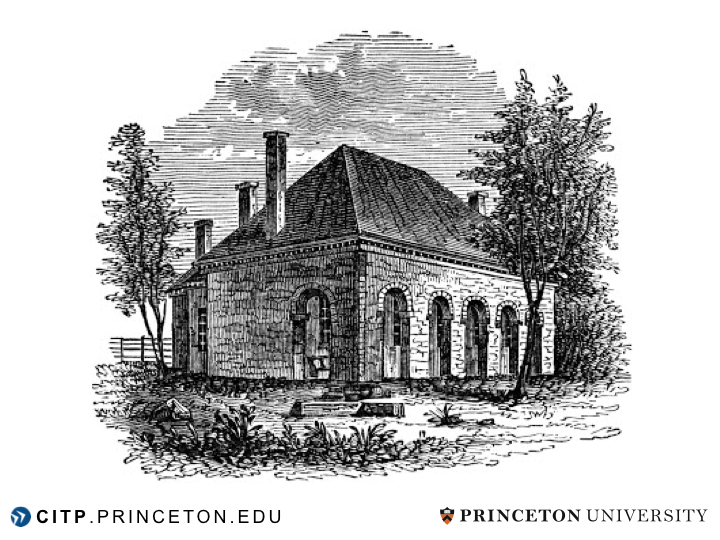 Patrick Henry was 27 when argued the Two Penny Act. He went on to lead the campaign against the Stamp Act, resisting the crown's tax on the free press. It was he who said, "give me liberty or give me death." 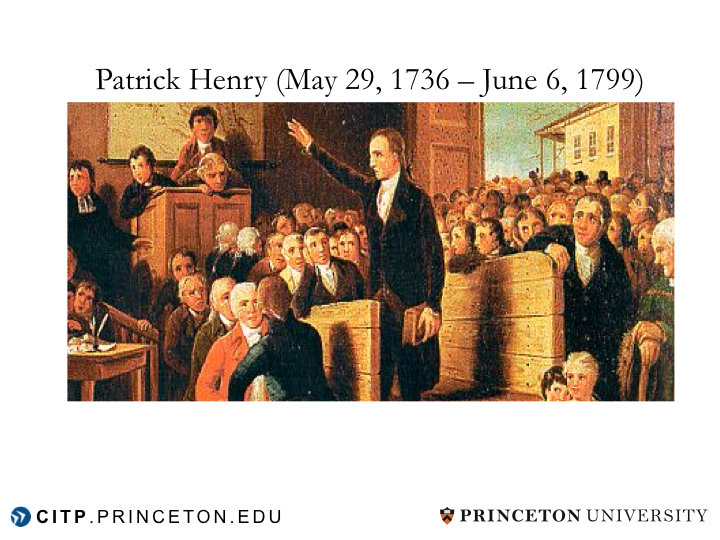 Like Patrick Henry, Aaron fought for fundamental democratic rights. Here, he's championing the successful opposition against the internet censorship bill SOPA. 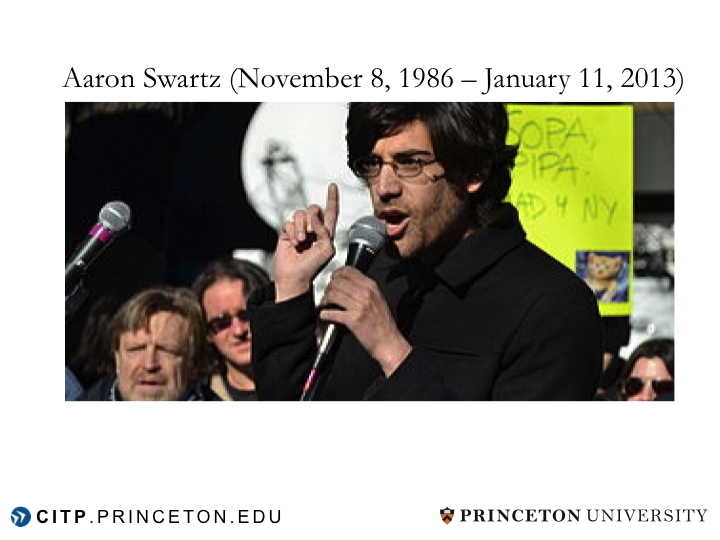 In his honor, believers in open access are rallying nationwide. 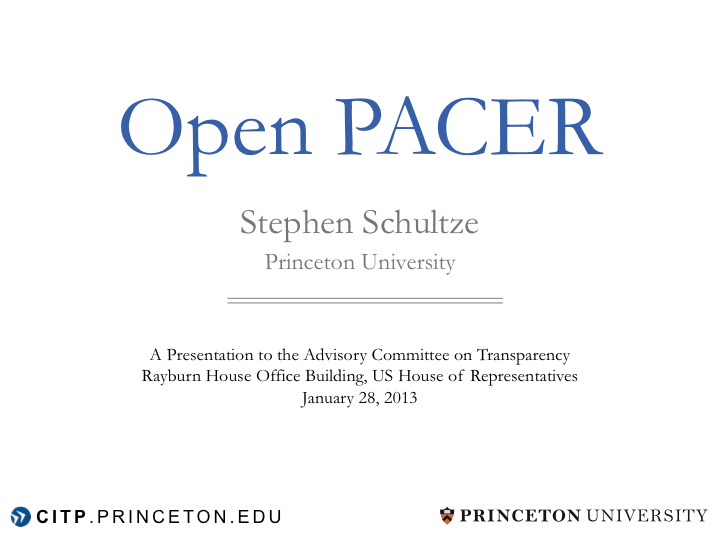 Today I'm proposing that Congress truly open PACER. 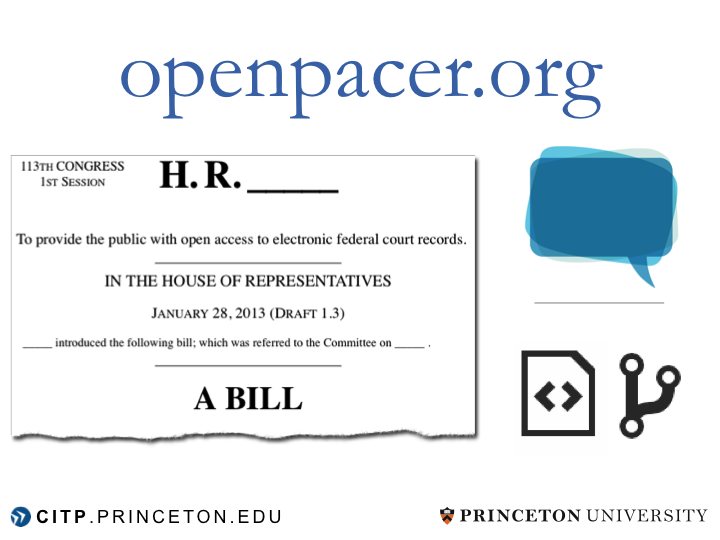 Open PACER is a bill that, once and for all, mandates that the courts provide free access to our public record. The bill is open for comment at openpacer.org. It is written in GPO-compliant Legislative XML, which anyone can edit and submit for incorporation via a tool called github. If you are with a representative in the room, I'm looking for sponsors.